Walked in for Sunday lunch after Musee Carnavalet. Full of mostly French having their Sunday lunch - roast poulet. Seemed very expensive (65 euros for asparagus starter ) so took main course only which was a huge serving of rognons de veau & huge plate of the best frites & steak/frites for me. Waddled out fully satisfied! Dark old Bistrot with brusque waiters. An experience. Lovely old school cafe with wrought iron bakery store front & retro ambiance. Good Bistrot style food. Lively outdoor terrace. Great for coffee, happy hour & people watching in this hipster area. 27 rue de Saintonge, 75003. Perfect for lunch or dinner. Fresh salads, specials, deserts prepared daily. Stylish and cozy atmosphere and resonably priced. Limited menu with excellent daily chef choice. Modern organic seasonal menu. Wide wine list reasonably priced. Loft style, relaxed atmosphere. Very understated, with quaint lace curtains, red checked tablecloths for an authentic 1960’s retro feel. Menu includes homey French classics like lentils, snail stew with mushrooms. Bistrot style at lunch, restaurant - quality at dinner. Friendly, laid back & reasonably priced. Upscale and chic. Modern, open concept design (feels like San Francisco!). Spectaular interior design. Delicous meats, tasting/ sharing menu. Sophisticated cocktail bar. A modern-fusion alternative to traditional French cuisine. Best to reserve in advance. Very elegant old school French restaurant (100 yrs old.) Beautifully appointed & superb French service. Serious cuisine by Alain Ducasse so expensive but worth a visit to experience the traditional French cuisine at its best. Fixed menu at lunch with the house Chablis offers good value. Michelin 1 star. Quiet so a good place to talk. Perfect, casual cafe for lunch with excellent food in a quiet corner of the Marais. Classic French menu, honest food. No need to book, at least for lunch. My new favourite. Small modern, quiet atmosphere. Unbelievable food prepared in a fresh way. Beautiful dishes. The pigeon & cappuccino potatoes were unforgettable. The dessert composed of layers of salt frosted meringue, creamy marscapone with lichee sorbet in between was so interesting for its mix of flavours & textures. The sea salt used was the salt “frost” from the salt flats in Gironde, Brittany - who knew salt frost existed. Casual cafe/restaurant with charming young staff, very old elevator to the cave, manually operated in restaurant. Good food reasonably priced. We had the best buffalo mozzarella ball starter & superb trio de pots de creme for dessert. Tiny restaurant tucked away in a square full of artisan shops. Quiet in the heart of the city with a lovely terrace. If you feel like a light lunch full of fresh vegetables presented in a beautiful & original way. Excellent ceviche & fish. Gorgeous space in the middle of the Marais behind an austere 18 century facade includes a winter garden terrace cafe with birds & a glamorous mirrored black/white dining room under a spectacular dome. Same menu for both spaces of good contemporary dishes (quinoa, scallops with artichoke mash) served by cool French staff. Height of the ceilings reminded me of the grandeur of some NYC restaurants with French clientele. Very good wine list. Even if you are not planning to go if you are in the area it’s worth visiting just to see the decor. Venetian with a huge wine list of Italian wines. Honest, simple “clean" food. Had a perfectly grilled tuna served on a red cabbage ragout. Nice change of cuisine from sometimes overworked French food. Friendly Italian staff. Charming old space. Very unassuming, tiny Venetian restaurant with incredible Italian food. Had the best pesto ever & freshest seafood plate. Not fancy but extremely good, reasonably priced. Mi- chelin states it is “Les plus authentiques de la capitale." Great food, best on the Île Saint-Louis. Worth a visit although busy with tourists like all the restaurants on the Île. Quick restaurant on the Île Saint-Louis with excellent food, and an old bistrot feel and outdoor seating. Buzzy, easy first meal in Paris. Breakfast, lunch or dinner. Excellent hamburger and frites and salmon tartar. Italian chef experimenting with truffles, egg foam, etc. Everything homemade in a dark chalet-like interior with fireplace. Unusual food, tres gentil on a very small, quiet street. Highly memorable dinner. 01 46 33 60 11, Closed Sun & Mon. Contemporary French Cuisine, elegant restaurant. Michelin 1 star. Expensive but worth it. Interesting dishes with superb service. Excellent desserts. Tasting menu. Still one of our favourites. All food is local, Parisian chef, vegetables are grown on the roof. Menu always innovative. Casual atmosphere, open kitchen in the centre. Good service. Young crowd, mostly French. You can sit at bar & have dinner if tout seul. Excellent traditional French bistrot owned by Alain Ducasse. Somewhat cramped but authentic. Enjoyed a superb lunch with French diners. Only available Mon to Thurs. Very small, bustling casual bistro which packs in the peo- ple as the food is superb & reasonable. Fantastic tasting menu (5 courses) for 55 euros. Excellent modern French Food. Friendly service. Casual. Same owners as La Semilla. We have only tried them at lunch. These two share the same Michelin star chef & have a similar feel given the very colorful abstract paintings & decor. Ze Kitchen is bigger, more formal & serious with the star officially while the menu at KGB is more limited but also superb. Creative fusion of French & Asian cuisine beautifully presented. KGB offers a tasting menu of 3, 4 or 5 hors d’oeuvres. Both require a reservation & small appetite. Perfect for lunch. If you are craving steak/frites this is the place as this is all they serve. They do it the French way with salad. Very fast, & busy reasonable. The world’s greatest Gothic mid 14th century cathedral. It took almost 200 years to construct. It draws the crowds at all times of the day but must be seen many times to take in all of its detail, beauty and enormity. Located on the largest island in the Seine, Île de la Cité beside, Île Saint-Louis, one must stand in line to gain entry inside to see the famous stained glass windows. Check it out at night for its dramatic lighting. Opened in 1985 with a long renovation completed in 2014, this small museum is located in a large 17th century mansion house. Instead of death duties Picasso’s heirs gave the French state many of his works covering all periods of his career. A fabulous space, comfortable sized museum in the heart of Le Marais across the river. Not to be missed. Home to the Musée National d’Art Moderne this incredible 1970’s building designed by Richard Rogers & Renzo Piano is an iconic & very popular place in Paris. It looks like the building is inside out with its workings (pipes, water ducts, elevator) placed on the outside giving the escalator ride up to its 5 floors one of the best vantage points to see the city. The permanent museum collection includes works from the Fauves, Surrealists & Cubists & there is always a contemporary show worth seeing as well as the street performers in the surrounding piazza. The excellent restaurant on the top floor terrace, Georges, offers great views of Paris. Located in the historic Hotel de Donon, a rare example of a 16th century townhouse in the heart of the Marais, this museum is devoted to 18th century art & antiquities collected by the founder of the Samaritane department store in Paris, Ernest Cognacq. Situated in two 17th & 18th century mansions “hotels” this tiny gem of a museum in a gorgeous venue houses an array of paintings, weapons, stuffed animals & curiosities displayed around the themes of hunting & nature from Africa, America & Asia. Quirky, surprising & modern. The Winter Circus. Just a short walk from the Eastern end of rue de Bretagne, (opposite the Filles du Calvare metro station) is the magnificent Cirque d'Hiver building. See live circus shows including trapese artists and elephants! Check on-line to confirm show schedules, tickets, etc. In the summer, stroll North past Republique (a few minutes walk) to the tree-lined Canal St. Martin. 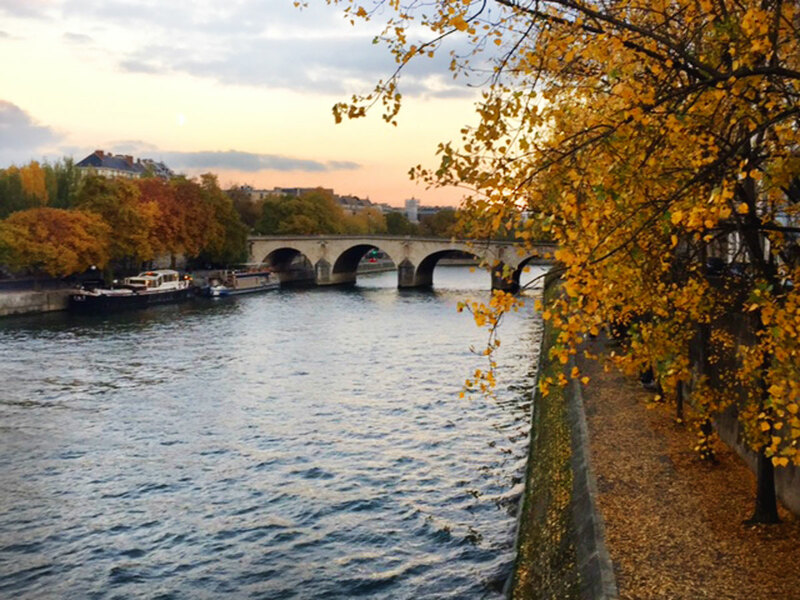 Originally built during the industrial revolution to transport supplies into the centre of Paris, this water way is now a trendy and picturesque place for a stroll or picnic. Cafes, restaurants and interesting shops line the canal. You can also enjoy a boat ride/cruise up the canal. Former royal palace created by Henri IV in early 1600's. Now a Parisian favorite with period architecture and a beautiful garden and fountain in the heart of the Marais, full of galleries and restaurants under the arches. Check-out the "secret" door in the West corner under the arcades leading to the Hotel de Sully garden and then rue de Rivoli. The smaller of the islands in the centre of the old city, Île Saint-Louis was formerly 2 swampy areas of pasture land for cows. One side was called Île Notre-Dame which belonged to the church and the other was known as Île de Vache (the Isle of the Cows) thus the restaurant L’Ilot Vache nearby. In the early 17th century, Henry IV ordered the islands joined to create a residential area. The island was raised, the gully filled in and the bridge, Pont St - Louis was built which joins it to the Île de la Cite where Notre Dame Cathedral reigns. Artisans and shopkeepers flocked to the central street, Rue Saint - Louis en Île, whereas nobility chose the riverside plots where they built elegant “hotels" or mansions. During the reign of Louis XIV, these homes were deserted as the wealthy left Paris for Versailles. By the 19th century, the Île had become one of the poorest quarters in Paris. More recently the Rothschilds, former French president George Pompidou, Marie Curie, Helena Rubinstein and Hemingway among others (Chopin, Baudelaire) have lived or worked at various addresses on the Île all identified by plaques on the buildings. There is a quiet park at the eastern tip of the island near the Pont de Sully where one can watch the bateaux mouche (Parisian open tour boats) make their turn. At this end of the island one can’t miss the massive ongoing renovation of the elegant Hotel Lambert which was most previously the home of the Baron de Rothschild and earlier the great French writer and philosopher Voltaire. It is now owned by an Arab sheik. The St Louis church was designed by the Royal Versailles architect le Vau who worked on Hotel Lambert as well. The Baroque interior is richly decorated with gilding and marble. The village like atmosphere, narrow streets, historic townhouses, tree lined quais and old bridges of the Île Saint-Louis attract many strollers in the spring and summer despite no metro/subway connection. One of the attractions is the famous Berthillon ice cream and sorbet made on the Île. Still a family owned business from the 1920’s they were the first to make artisan sorbets flavored with lavender, foie gras, etc. In 1924, the Island locals made an attempt to secede from Paris and France, and Île Saint- Louis passports were issued. Now the island is home to both old French families and discerning foreigners looking for old world charm, conformity of architecture and the solitude and beauty offered by the island locale. 3 shops full of cool housewares, fun gifts. Gorgeous, unusual purses made in Paris. High street French fashion chains along Vieille Temple & cross street Rue des Francs- Bourgeois including BA+SH, Maje, IRO, APC, Eric Bompard for cashmere, Sandro, Carven, Cotelac, Y Bimba, BenSimon, Gerald Durel, Majestic filatures for tshirts, tops in linen, silk, cashmere, etc. Three- floor concept store with minimalist housewares, perfume & fashion. Renovated printing factory so interesting decor. Three eating areas. Cutting edge fashion, many avant garde labels in a beautiful, dark cave like store with sumptuous displays for both men &women. First concept store copied 10 yrs later by Colette. Three locations in Paris. Hours are 10-8pm, closed Sunday. For the latest in designer wear plus all the trendy brands already mentioned, the best place for one stop shopping is Le Bon Marche department store on the Left Bank. It is the Harvey Nichols or Bergdorf Goodman for the French. If your time is limited this is the place to go. The store is beautiful, the food hall, La Grand Epicerie de Paris is amazing and the selection of fashion, lingerie and home decor is the best. The shops around Le Bon Marche in St. Germain the 6th arrondissement are also excellent and worth exploring. It is a good walk from the apartment at least 25 min. Sevres-Babylone is the metro stop. Founded in 1852, it was the first department store of its kind started by a hatmaker and his wife who expanded their stall to sell a range of items at fixed prices with home delivery, item exchange, etc. The concept took off around the world. In 1988, LVMH took over and rebranded to make it the most exclusive Parisian store in the city.